There was no movie watching last night after all. Adding pictures and finishing the post kept me up later than I would have thought. Today I wake up around 8:20, but feel this cold coming on and really should sleep more. I stay in bed and start watching Moonrise Kingdom after some blog reading and Duolingo, trying to fall back asleep. But I can't, which seems to always happen on the days I could actually sleep in. It's a rainy Saturday and I would really love to stay in bed and rest up, but I also want to see my friends. 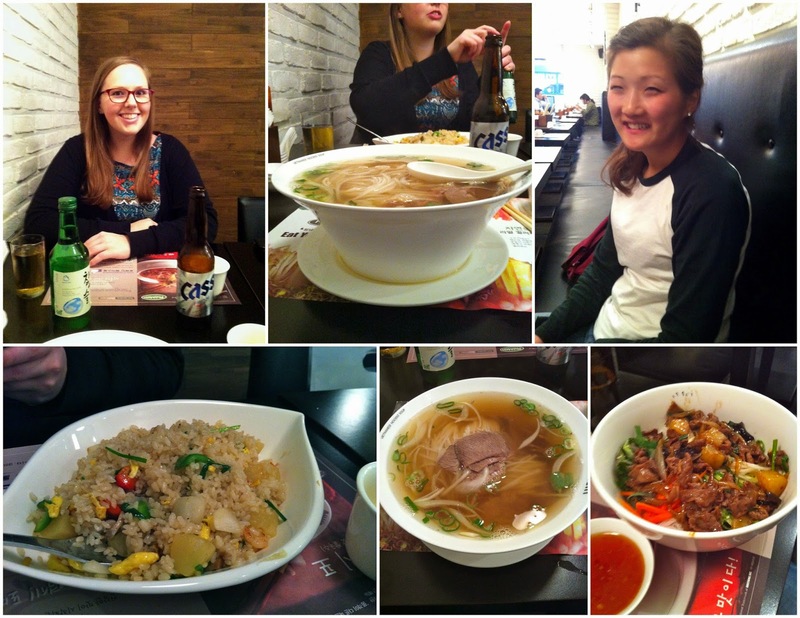 Weekends are the only time I can see my fellow Badgers since we all live so far apart (in the Gyeonggi-do province). So around 10:45 I pause the movie halfway through and get up to shower and put my steel-cut oats on the stove. While eating my oatmeal (with brown sugar and a scoop of peanut butter mixed in, and banana slices on top) I G+ (video chat) with the boy back home for about an hour before I really need to leave the house to bus into Seoul. 12:16 - Leave my house, walk to the bus station. Meant to leave at noon, whoops. 12:20 - Wait at bus station. The "good bus" that takes me across the river to Seoul Station in an hour and a half (with good traffic) only comes once every 35 minutes. Unfortunately the TV screen at the bus stop only shows the number of minutes until arrival for the other buses, not my bus. The "good bus" number only shows up on the screen when it's a few minutes away. I check my bus app, and the information for the good bus is currently unavailable. 12:35 - The "bad bus" comes by so I hop on, since I don't know how long I'd have to wait for my preferred bus. This bus takes the same amount of time to get into Seoul, but only to the south side of the city, below the river. 14:01 - Our bus finally gets to its destination in Seoul. I get off the bus and onto the subway. Message the girls to say I'm running late (we were meeting at 2!). I have the metro ride now with one transfer. Abby's already at our meeting spot but Anne's running late too, still on the metro. 14:30 - I finally get to the stop. It's a big station, but I walk through to Exit 10 where I'm supposed to meet Abby and Anne. 14:35 - Get out of the exit but don't see anyone. Abby should be here though. Shoot, was it Exit 8? I take my phone out of airplane mode to double check our messages. I see that meanwhile Anne had asked which metro stop we were meeting at, as our previous messages could have been interpreted either way between two stations. I find out Abby was one stop away, and I had misunderstood our earlier messages. Anne was still on the train, so she stayed on one more stop to where Abby was. I go back down into the metro and ride a stop. 15:00 - To my horror, I arrive an hour after our intended meeting time. Ah! So sorry! As you can see, it takes a while to get somewhere in Seoul from my apartment. I also get really exhausted on the bus ride, and often a bit nauseous even though I wear Sea Bands and am sure to sit in the front. So that's why it usually only happens on Saturdays, sometimes just every other weekend. The area is really neat. 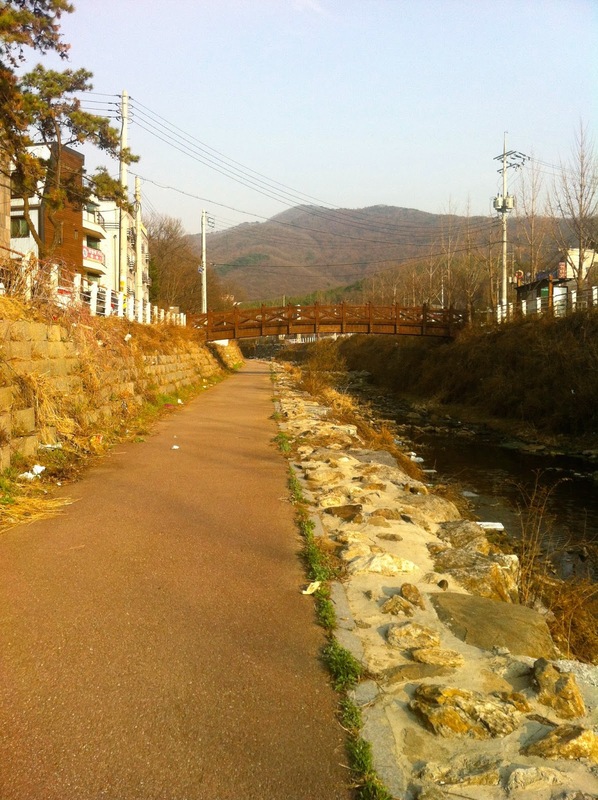 We're up in Jonggak and I've never been there before. We stop in an Artbox store (because I've never been). 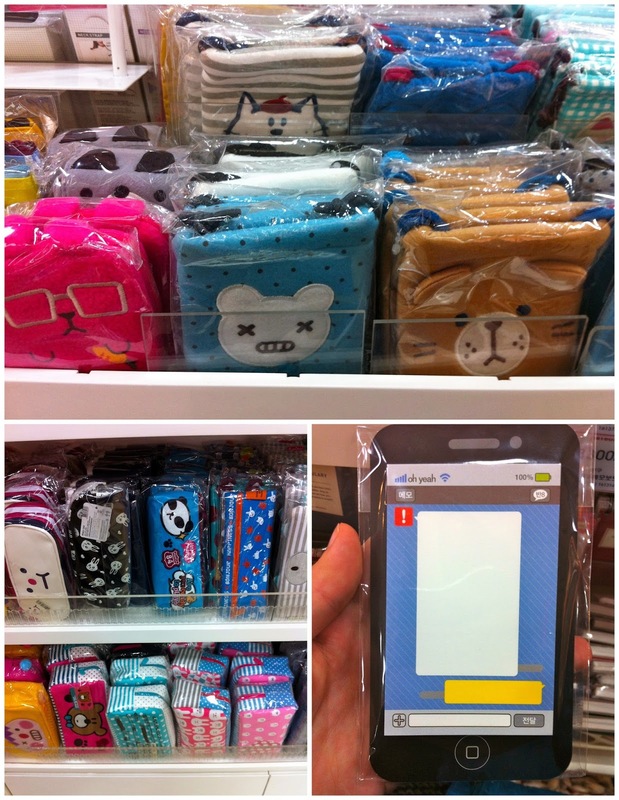 It's filled with everything cute: stationery, folders, pencils, passport covers, stickers, bookmarks, cards, journals, etc. Great place for gifts! I'll have to stock up on some cute stuff later this summer. I get a small (cute) travel pouch which will be nice for keeping deodorant/toothbrush/retainer and such together in the backpack for a weekend away, or to keep smaller things together in a suitcase. I ate the whole thing and it was delicious! Really great to have a nice long meal with friends and conversation. This only happens once a week max, and sometimes I've gone 2+ weeks without going into Seoul. So I really value and appreciate the time together. We recall that some other Badger friends are meeting for dinner in Seoul tonight, but we've just eaten and they were going to meet in another area of the city, south of the river -- not sure if we can meet up or not. We go for some dessert in the area at a gelato/waffle place. I opt for a brownie with one scoop of gelato. One main street in the area is pedestrian only, and it's called the Avenue of Youth. 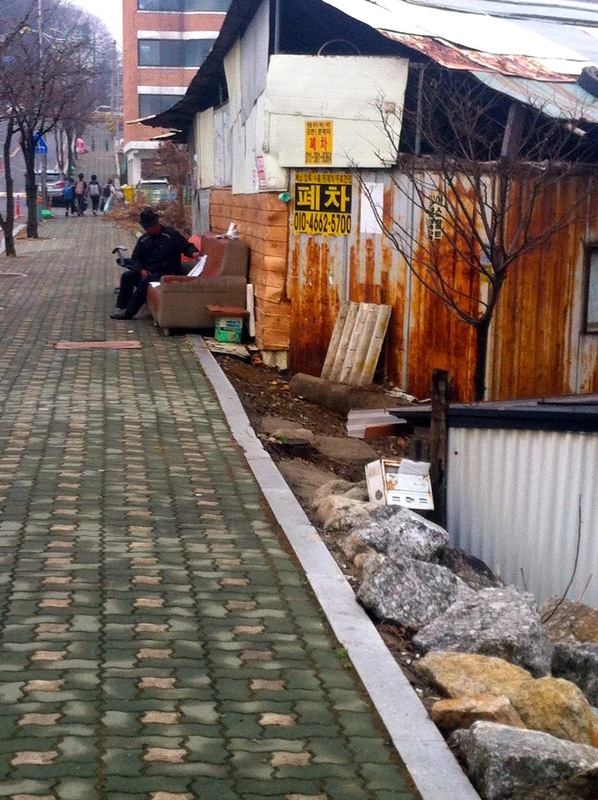 It was really neat to be in a new part of Seoul (for me) -- so different from my town. Lots to do and see and eat. Lots of young people. After dessert we go to a nearby bar for drinks. And before I know it it's 21:20 and we all need to get going so we can metro to catch our various metros and buses that stop running sometime after 22:00. I wish we could stay - there's so much more to talk about! 21:48 - I get to my bus stop at Seoul Station. I always take the "good bus" home; it's the only inter-city bus I know from this location that goes to my town. The sign says it'll be here in 24 minutes, which isn't so bad. There have been many nights I've gotten to the stop and seen that it'll be here in 74 minutes. Yeah, groan. I'm usually exhausted by that point, too. The bus comes a little after ten, and I'm home around 23:30, tired as ever. I kind of feel like a zombie walking back to my apartment in the light drizzle. I'm up at 8:30 again after getting to bed after 12. I have about an hour before the Badger game starts, so I start blogging about yesterday and make sure I'm set up to stream. Add some water to the rest of the oatmeal in my pot I made yesterday and reheat it on the stove. 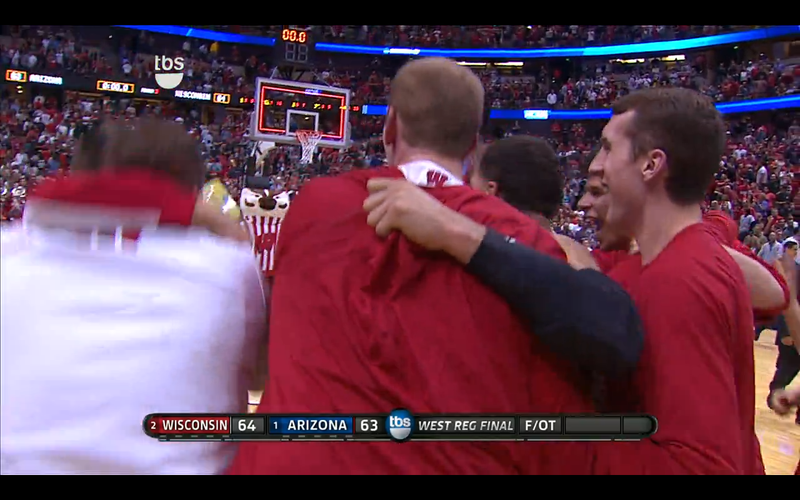 I watch the Badger vs. Arizona NCAA game live from around 10 in the morning until sometime past noon. We win in overtime! So exciting! I clean up in my apartment this afternoon. It's super nice outside, I've got my window open. In the late afternoon I walk to the grocery store and get some more of that chicken I got for the first time on Friday. I have those Sesame leaves to use up in my fridge, and I'm feeling lazy. The lady who works at this booth in the grocery store is so nice to me. She gives me coffee while I wait for the regular chicken to be done, and then has me eat a sample of the spicy chicken. Lots of smiles, and she tries to use some English words interspersed in her Korean. I smile a lot because I don't know what she's saying at me in Korean hah, but she's very nice and I appreciate it. Lots of people outside. When I feel healthy next weekend (I'm assuming I will) I'll spend more time outside on Sunday. It was so nice out today. I eat while reading right in front of my open window. Read for an hour. Finish cleaning, blog, call mother because I see that she's awake super early via an email. It's 20:30 now, so I'll finish this post, shower, and then in bed to read/write and have some tea before bed. Fridays are great when I get to the weekend before everyone back home, but I'm always a bit envious on Sunday afternoons when Wisconsinites are having their Saturday night with a full day yet ahead of them. Meanwhile I've got Monday staring me in the face, and I'm not sure what lesson I'm even teaching yet. Luckily I'll have first period to figure that out; hopefully my co-teacher is around to ask. Here are the BBB's final questions. 1) Do you always try all the foods offered? Have you made an effort to try a variety of new foods or do you tend to stick to the things you've found and like? Yes, I try all the foods at lunch every day (usually eat most of everything too), and at the Korean dinners I've been to I try whatever's on the table. I may eat more of one side dish than another, but I usually have at least a little bit of whatever's there. Korean food is good, even if it's tentacles from some sea creature! Eating the food gets you huge bonus points with your co-workers, too. Regardless of its logic, they tend to have a more positive/favorable view of a native English teacher who eats Korean food. 2) What plans do you have when the yearlong contract is up? Will you renew? Why/why not? No, I will not renew. While it would be much easier to finish the current school year (through February 2015) after all I've learned since last fall, one year will be enough for me. 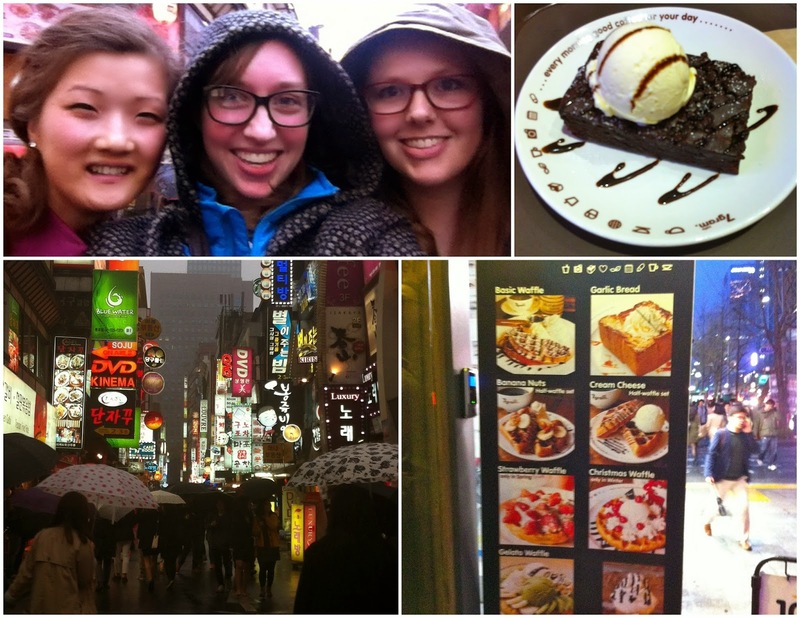 Korea is not a country I could live in long-term, though my time here so far has been irreplaceable. There's more of the world I want to see, and I do have family, friends, and a boy back home who would all like to see me - and I, them. I have about two months of travel/visiting friends planned in my mind for when my contract ends, and then I'll return home late fall and happily be around for Thanksgiving, Christmas, and New Year's. Who knows what the next adventure will be. 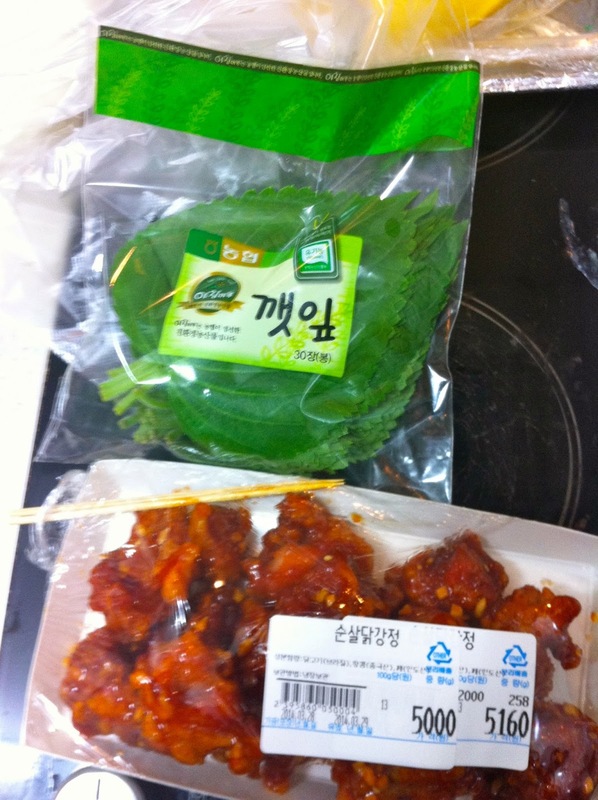 Over the last few months I've slowly introduced some "new" foods into my diet here in South Korea. I use quotation marks because they're not new at all, but I wasn't eating them last fall. After discovering iHerb, which ships to Korea from California for $4, I purchased and have regularly been eating oatmeal. On the weekends I make steel-cut oats and add some brown sugar and a spoon full of peanut butter to my bowl. I do have some instant packs of oatmeal for weekdays when I have less time. However I don't use a microwave to make them; I add boiling water using my kettle. Next I started to eat eggs, which happened as a result of reading about them so often in Tim Ferriss's The Four-Hour Body. I added eggs to whatever I was making that day: soup (egg-drop), rice, rice pasta with tuna. Now they're a regular item I always have in my fridge. When I was a child, I remember we had this big, round yellow tupperware filled with raisins in the kitchen. We'd always snack on them, just reaching our little hands in and eating. I have no idea when that container left our house, perhaps it was when we moved, but without the raisins around I stopped eating them. I never purchased them living on my own post-high school. I saw some small boxes on iHerb, so I ordered a pack of six. What a great little snack! I have a box in my desk at work in case I get hungry or forget to eat breakfast some morning. Just the other week on some IBS forums I read about bananas being a good fruit for IBS sufferers. I hadn't bought bananas because I'd only seen big packs at my grocery store (10+ bananas), and I wouldn't be able to eat them all before they'd go bad. So I just never bought any in the first place. A few weeks ago my Korean friend told me that he's now eating 10 bananas a day. While I wasn't going to try to reach that extreme, our conversation put bananas back on my radar. On my next trip to the grocery store I happened to see a smaller pack mixed in with the rest: five bananas. Perfect! In the past week and a half since, I've purchased more bunches, and now eat a banana in the morning for breakfast and another when I get home from work. Last week I even mushed up a banana and mixed it with some eggs, cooking a sort of banana pancake! These are very simple, basic foods to have added to my diet. I'd like to stress how the changes happened, though: gradually. Over the course of many months. The "new" product was usually initiated by exposure: in books, blogs, websites, and conversation. These food items have completely replaced the processed "treats" and "snacks" I had been purchasing in convenience stores, which can be found on every Korean street. Heck, I've been gradually changing my diet for years. Comparing what I eat now to what I ate six years ago is a night and day difference. And I'm still working on it, slowly but surely. It's a lot easier to focus on just one food item than to change all your eating habits at once. So start small, and over time that one food will become something you don't even think about. You'll regularly buy it and eat it. And then you can focus your energies on another food item to introduce into your life. Just take it one at a time, and little by little you'll replace old shopping/eating habits with new ones. What food should I start eating next? 7:25 - Alarm goes off. Snooze. 7:46 - Get up and go to the bathroom. Grab a banana on my way back to bed. 8:07 - Hop out of bed. This is really pushing it for me, because I always used to try to leave at 8:10. This is the first day in Korea since fall that I don't put on leggings under my pants (jeans today)! 8:15 - Leave, walk to school. 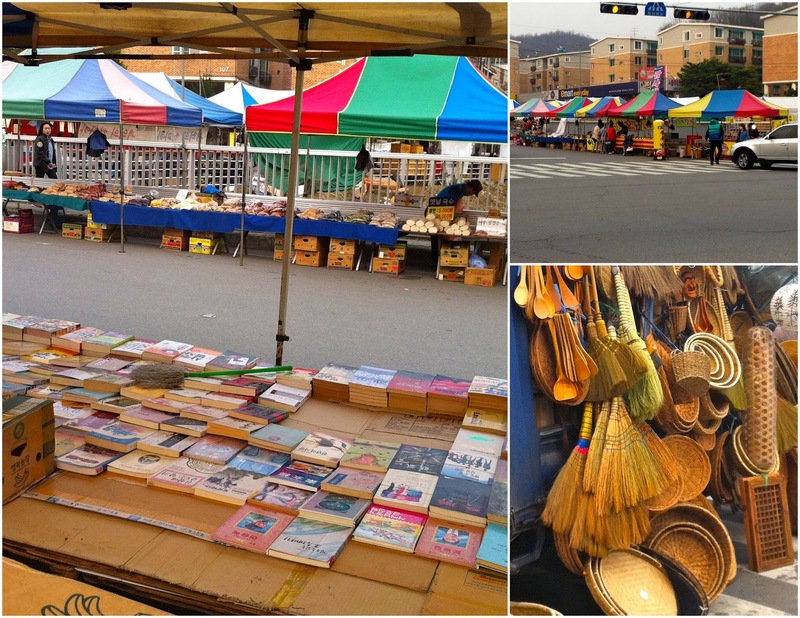 See that they're setting up for the market today. 8:35 - My co-teacher YH comes in from next door and asks me how to play Go Fish. I tell him the rules again, and he says the problem is some students might have lost their flashcards so we should make copies of extra cards (he brought this up yesterday, but yesterday he thought there'd be enough). His cards are ripped out of the back of the book (and not with him). I've already ripped out my cards too, but I put them in the pocket that's in the back of our new 3rd and 4th grade textbooks, (which I love, by the way -- that they added a pocket for kids to keep all the flashcards). So he takes them with him to go make some copies. 8:38 - He comes back with the copies. I take them and cut the stack with a ruler and utility (x-acto) knife, which is how they cut big stacks of paper here. Most kids have utility knives in their pencil cases too, which surprised me at first, but it's normal and the kids can handle them. 9:00 - We start the day's lesson. We're reading and writing about sports: basketball, baseball, tennis, soccer, and badminton. When it's time to play Go Fish he has everyone get out their cards, and chaos ensues. He passes out the extra cards we made to all the kids who have lost theirs since Tuesday and has students push their desks into groups of four. Nobody's listening to us explain when we demonstrate because they're all playing with their cards -- the game they learned on Tuesday. If I were doing all of the leading, as I do with my other co-teacher, I would have had them watch us play before they got out their cards. So we end up going around group by group to explain. Many are simply playing the game from Tuesday, but after I sit with each group for a few minutes and show how to play, they catch on. 9:43 - During the break time I say to YH that maybe we could try demonstrating the game before they get their cards out, that perhaps they'd listen better. Yes, okay, he seems to be in agreement. 10:15 - It's time to learn Go Fish, and YH tells the class "OK, get out your cards!" before we've explained anything. That's not what I'd had in mind, so I groan inside but just I roll with it. There's lots of background talking during the explanation, but at least he hasn't had them move desks into groups of four yet. 10:26 - YH tells the kids to stop playing, but it's super loud and nobody listens. He's saying a bunch of stuff in Korean at them, but I'm not sure if any are listening. Many are still playing. Eventually they get desks back in place and put their flashcards in the book's pocket (I hope), and then they're off. My other co-teacher is always on top of discipline; the class must be quiet and listen to me. But with my new co-teacher it's usually louder than I'd like, with background chatter and wandering eyes (and hands) even while he's talking. 11:02 - The third period is now learning how to play Go Fish. YH and I are demonstrating at the front. We've just demonstrated what happens if the partner does have the card I ask for ("Let's play basketball!"). He gives me his basketball card and says "Sure". I show my pair to the class and set it down on the desk. The kids are nodding their heads and go "Ahh" in the tone like "Ah, now I get it". And then many turn to each other and start trying to play. But we haven't finished explaining yet! A student at a group in front asks YH a question in Korean about the rules, and YH starts listening, talking to just that one kid while the rest of the class has stopped listening and started to play. No! Attention back on us! They don't know how to play yet! But YH is helping that one student over at his desk. Finally he comes back and says "Ok, look at us." and then some stuff in Korean. But there's so much talking and card-holding. So I step in and say "Hands on your head. Hands on your head." This gets more students to put their cards down and look at us. YH tells them to put their hands down, and now we demonstrate what happens if the person you ask does not have the card: "Sorry, I can't." and you take a card from the middle. Phew. 11:16 - (With my other co-teacher, she always plays that lesson's Chant when it's time to stop playing a game or doing an activity. It grabs their attention and the kids start chanting along as they get back to their seats.) So near the end of the third period now, YH tells them (I assume because it was in Korean) to put their flashcards away and stop playing, but there's still tons of talking and playing. So I go up to the computer and play the Chant without consulting YH, then help kids move desks back to where they should be. The kids get the idea. 11:30 - We start the fourth and final 4th grade class of the day. Same as the previous three periods. 12:08 - YH is busy helping a group, but I know we should be cleaning up (period ends at 12:10), so I decide it's clean up time and just go ahead and play the Chant. 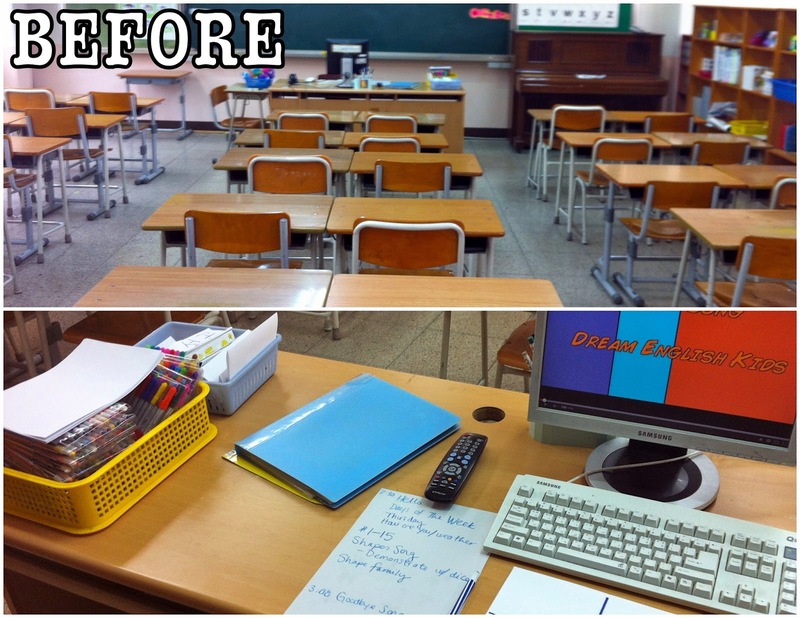 It works and students put desks back into place, stop playing, and start chanting. Two teachers sit down at our table over five minutes after we got started eating, which I'm glad for because it'll take them longer to finish, so I've got some more time now. Partway through this little first grade boy came and sat next to the kind librarian teacher at our table. So cute. 12:35 - The first grade boy in red (pictured in the background above) comes over and asks me something in Korean, with the name "Holly" in there. Holly is a first grader, the only "white kid" in school, as her mother put it when I met her last fall. It sounded like he was asking "how much" in Korean, with Holly's name, but then I figured out he was asking if I was Holly's mom. No, I told him - in both English and Korean just to be clear. I wasn't surprised though, because my past co-teacher (EG) last fall told me some kids had asked the previous Native English Teacher, Jessica, the same thing - if she was Holly's mom. We're the only two westerners they see, so young minds draw connections. 12:44 - We all leave the table together and take dirty dishes over. I was last in line, so I linger a bit and snap some pics of the set-up - just for you, dear reader! Then I go and say hello to Holly. I barely ever see her, but I'd like to befriend her if I can. Someone she can speak to in English! (I have no idea how much Korean she speaks -- I'll have to ask her that next time). Now that she's in first grade maybe I'll see her more at lunch. 12:47 - Get back to my office from lunch. Way later than normal, I love it. 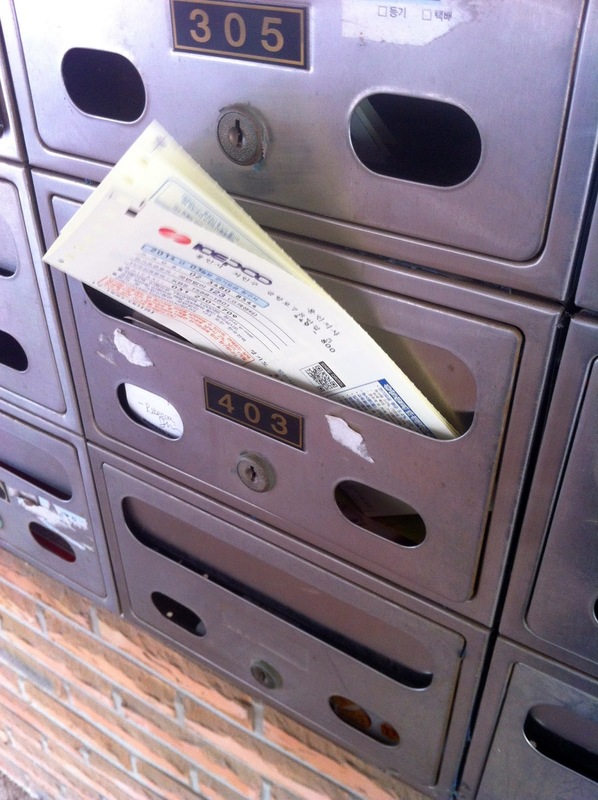 13:01 - I remember that I'd wanted to send a funny youtube video to my past co-teacher EG and YJ that I saw last night. Frozen was a huge, huge it in Korea too, so many students know some of the songs. We even taught some in English class back in February. Here's the video: A young girl is crying while having a splinter taken out of her knee by her mother, so she sings through the pain! 13:02 - Just as I'm about to press send, YH comes in the office and says let's have tea time (next door). So I quick press send, grab my mug, and go next door. I mention to YJ (We're in her office for tea time) that I just sent her a funny video if she wants a laugh. So she gets the speakers set up so we can hear sound, and the three of us watch it in the office. I don't think they found it as funny as I did, but it still got some smiles. (EG seemed to have enjoyed it, in her message response). 13:12 - YJ leaves momentarily to brush her teeth (Koreans brush their teeth three times a day, so all the kids/teachers have a toothbrush and toothpaste that stay at school for brushing after lunch. I have not partaken in these brushing activities.) Meanwhile YH looks at the related videos and clicks on one where a woman shows how to style your daughter's hair like Elsa from Frozen. 13:15 - YJ walks back in and it was funny because YH and I are just watching this lady do a girl's hair, and YJ says "What are you doing?" and laughs, but then she sits down and now all three of us are watching. 13:16 - A 3rd grade teacher comes in to sit and chat, and it was even funnier seeing his reaction to the three of us watching this video in silence. He asked in Korean if any of them could understand it, or just me - because the lady was talking at regular native speed and using hair terminology and stuff. 13:35 - Back in the office after an abrupt ending to tea time. The teachers started telling me that there was a visiting teacher there today from a nearby college or something, and then the first grade teacher said wait, are they here already? And the three of them got up and looked out the door, and his third graders were back so he had to leave. YH left, and so I grabbed my mug and left YJ's office. 14:10 - My 2nd grade class starts in 20 minutes, but I go to the English room now because I still have to clean up from our morning's 4th grade classes and get set up for this afternoon class. 14:30 - They're on time today! And there are boys and girls. The boys are crazy wild again today. They're just a bad combination - too many "trouble makers" together in the same class. We do our hello routine, do a counting video from 1 - 15 (11-15 are new to them), and then review our Shapes song before a coloring activity. They each get a piece of paper and fold it into four sections. I choose a student to give me a shape (triangle, for example). I draw a triangle on the board. Then I solicit a color (blue, for example), and put a blue flashcard below it on the board with a magnet. Lastly, a student gets to roll this stuffed die that we have (four, for example). Then they need to draw four blue triangles. I played the Shapes Song while they drew, and when the song ended we'd choose the color/shape/number for the next one. They actually responded quite well to this activity, I wasn't sure if it would interest them or not. Well, four or five of the boys were just goofing off the whole time, but the rest of the kids were doing it. One of the hardest parts with this class is choosing one kid when eight hands are enthusiastically raised "Me! Me! Pleeease! TEACHER! TEACHER!". How do I decide which student to call on? And if you don't call on them they can be so bummed out and upset. My other problem is that if you call on a student once, they'll still anxiously raise it the next time, as if you haven't called on them once yet. So with this many kids it's easy to forget who you've already called on. But anyway. 15:12 - The students leave, and my room is trashed per usual. The boys for whatever reason like to rip up whatever paper they have their hands on and leave it all over. Markers are on the ground without caps. I discover that one boy colored all over his desk! So I start cleaning up. I put some Regina Spektor on the TV so I have some background music. 15:36 - Finally finish sweeping and re-organizing all the packs of crayons and markers (making sure each pack has one of each color) and go back to my office. 15:45 - YH and I start talking about tomorrow's fifth grade lesson. He's found a document online (Korean teachers have a site where they share teaching materials) with tomorrow's "Listen and Say" script on slips of paper that the students have to put in order. Then he says he'll look for a different game for the final activity, because he doesn't like the book's activity. I suggest a game, but I can tell he's not sold based on his initial reaction, so I say "Or maybe there's a better one on the site", and he says "Yes, I'll keep looking". He finds a Baskin Robbins game, which is a reading game. Tomorrow's period is not reading-focused (It's only the second period. Reading/writing always come in the 3rd/4th/5th periods of a lesson. The first two are to introduce new words/phrases and get kids comfortable hearing and saying them.) The game goes like this: There are some sentences on a PPT slide. On each student's turn, they can choose to say either one, two, or three words. Keep going around and whoever says the last word (the 31st word) is out. In this version he found, it says the student can do a dance in order to stay in the game, so I'm hoping it's entertaining. 16:04 - YH prints six copies of the slips of paper for the ordering activity on the color printer, which comes out to 12 pieces of paper. I start cutting them all with the utility knife, but can only do two at a time. 16:29 - Finish the pages he'd handed me, which comes out to four sets of slips. He has the pages for the two remaining sets but says he'll cut them tomorrow morning. Clean up, pack up, shut down. 16:34 - We leave the office. I head to the grocery store for more bananas, but seeing the bank (right next door to supermarket) reminds me that I have a bill to pay, so I stop there first. I was going to just pay it at the ATM, but I see that the bank is still open inside. I thought it always closed at 16:30, so I go inside and grab a number. We have bank books here, just like what I had in Spain, and I was on my last page and needed a new one. (You put your bank book into any ATM and it prints out all of your transactions into it since the last time you printed transactions. So handy! You can also use your bank book like a debit card in the ATM machines, and transfer/withdraw money.) I really love these bank books, don't know why the U.S. doesn't have them (nor why we still use checks! ), but I digress. 16:46 - I have a new bank book in my hands! I'm so happy at how painless it was! The lady understood what I was asking for based on my motions, and all I had to do was show my ARC (Alien Residency Card) and then sign the new book! Then I pay my utilities bill by doing a transfer on the ATM, which is also really easy. The ATM has an English menu, and the account number to type in is located on my bill. And boom - instantaneously the money is where it needs to be! (Cough no checks in the mail, needing to be deposited cough). 16:50 - I get some bananas from the grocery store, as I'm down to one from my last bunch. 17:05 - I pass the market, then sit at the park, eat a banana, and read for a while. A nice day again, but I'm not in that enthused running mood like I was yesterday. 17:45 - It's getting a bit chillier as the sun gets lower. I get up and walk home. Do some blogging. Usually on Thursdays (about every other week, I'd say) I get dinner with Woo Seok at 7pm, my only Korean friend outside of school. He doesn't live in my town, but he works (owns) a business here, about a 10 minute walk from my apartment. Last week he had to cancel, but said this week would work. I forgot it was Thursday and didn't get any Kakao messages from him yet today. I don't ask though, because I'm feeling tired and know I've got to do my daily things (stretch, Give it 100 video, Duolingo, read blogs) and write this post, which will take me a while. So if we don't meet today I'll get to bed earlier. 19:10 - I'm blogging away and realize it's past 7. Guess we're not getting dinner this week. That's okay with me! 19:51 - My throat feels just the slightest bit sore, so I take a Zicam that my aunt sent me just to make sure I don't get a cold. Time for some tea with honey to sooth the throat. 20:52 - I cook the same dinner I had last night. 21:45 - Call my friend on his way to work again. 22:05 - Finish call. And now I'll finish this post! 1) How has this experience changed you? I definitely have changed, thought it's hard to articulate exactly how. In some ways, I've continued to become more myself, since my prior values have been strengthened by coming here (education, teaching, helping others, travel, cultural understanding, snail mail). I love seeing children smile, I'm overjoyed after a successful learning activity, I'm thrilled to see progress and to be able to help students learn. I love learning about a new group of people and their way of life by living in their society. Living here in Korea has reinforced that there is so much to learn and experience in this incredible world, both with people and nature, and that I want to continue exploring and uncovering hidden treasures as much as I can. This experience has made me much more aware of Eastern cultures, which I've really enjoyed. Lacking exposure to Eastern people, my mind grouped them into one big category prior to this year: Asians. I now have more of a context if I were to meet a Korean or Thai back home, for example. My perspective has once again been widened, as it did when I lived in Spain, and I want to experience the culture of other Asian countries now. This job has let me finally live alone for the first time, which I now know that I really like. I'm a better ESL elementary teacher than when I started (you'd hope so!). My co-teachers last fall were great role models, and I learned a ton just by observing them when we taught class together and talking with EG about lesson plans and activities. This was my first time teaching at the elementary level, so the experience will definitely come into play with any future teaching opportunities or schooling. And the challenges and hard times have only made me stronger, and made the triumphs that much more victorious. 2) What has been the most difficult aspect of Korean life to get used to? Ah, how to choose which one. Probably the language barrier, though the social hierarchy is a close second. I've lived abroad before and like to think I'm quite flexible, so adjusting to daily life in Korea wasn't too strenuous. No dryer? I've lived without one for the past three years, no problem. "Small" kitchen? Spanish kitchens are also very small, it's okay. Wearing clothes that cover my shoulders? I can do that, no problem. Bowing all the time as a greeting? It quickly became a habit. But not speaking the language? That was totally new to me, and it is isolating and harder to understand the reasons behind the culture if you don't know what people are saying. I did go to Korean classes last fall for a few months and learned the Korean alphabet (so I can read), some very basic words/phrases, and numbers. I also bought some textbooks for self study, started having Korean/English exchange with Woo Seok once a week, and used websites and apps to study from too. In the winter I realized as I neared my halfway point (and made my new year's resolutions), that the time/energy I put into studying Korean further wouldn't give me an equal value in return. What would be the purpose of studying all these random vocab words if I was never going to use them? For daily interactions at the post office, grocery store, etc, simply knowing "hello", "thank you", and "goodbye" get me through without a problem. The other factor in my decision to put Korean on the back burner was that I had other things I wanted to spend my time studying. So I chose to let French, coding, and health studies take the place of Korean. I still practice on my phone apps or crack open the textbook every now and then, it's just not my main focus. I've felt okay about the language barrier lately, but in January and February not speaking the language was especially frustrating for me. And the frustration/isolation wasn't always from not speaking Korean, but many times from having all of my English conversations be with non-native speakers. Small simple things are often misinterpreted and then require much explanation to point out the miscommunication and what you had originally intended to say. It's harder for ESL speakers to pick up on meaning behind tone or certain wording. (For example: Once without thinking I said "Oh, that's okay" in the tone we'd use to decline an offer, but it was received as "Ok, good" - as if I had accepted the offer). Having to deal with this during every single interaction is - for lack of better words I'll use them again - frustrating and isolating. Many times it's easier to just say nothing at all. I've experienced seven months of this, so I'm finding it hard to describe all of that in a few sentences. And on to my "close second" answer to this question, the social hierarchy. Before I proceed to explain, I'd like to just point out that I am not an expert on Korean life/culture in any way. This is just my perception based on experiences I've had, books I've read, and conversations I've had with Koreans (in English). It really bothers me that people are so defined by their job. If you have a high ranking position at a good company, everyone bows really low to you and you are seen as "better" than others. Thus, people in lower positions think they're not as good. Students are pushed too hard to study as much as they can, because if they don't go to a good college they won't get a good job and marry well and have a good life. It'll be somewhat shameful for the family. So where does that leave creative folks? People that want to make art, music (not k-pop), or write? People who aren't interested in becoming doctors, lawyers, and engineers? Where's their place in society? The other part of the social hierarchy I don't like is that it's as if the people at the top can do no wrong. If the principal at our school, for example, gives an order that the teachers don't agree with, or that they think is the wrong way, the teachers will simply comply and keep their mouths shut. They have to. It would be disrespectful and completely against social norms to do otherwise. But I strongly believe that there should be room for dialog between boss and employees, and that people should be able to call someone out or make suggestions/critiques. Here are my fellow Badger bloggers' posts for today. I encourage you to take a look! 7:14 - I wake up before my alarm but not because I feel rested. Go to the bathroom, crawl back in bed and read some blogs. 7:52 - Turn off my alarm (after having snoozed it a few times). I'll get out of bed soon. 8:02 - Jump out of bed to brush teeth, get dressed, eat a banana. 8:14 - Leave for school. The ground is wet, it must have rained during the night or early morning. Almost to school. Yes, that's a couch and some office chairs that remain outside. Some older men are usually hanging out there. 8:25 - The same first grade girl from yesterday greets me with a hug when I walk through the hall -- I could get used to this! Such a great way to start the day! I walk into the office and YH arrives about thirty seconds after me. 8:35 - Co-teacher YJ gets in and grabs the English key from our office. I ask how she's feeling. "Not so good" she says, and I can hear in her voice that she's still very much sick. 8:51 - Today I've got third graders with YJ, so I go to the English classroom to write the day's objective and activities on the board. I take a plastic cup and put it in a mystery bag, as the new lesson is called "What's this?". YJ doesn't do any talking today, as she's still really sick. 9:01 - I use the bag as an attention grabber, walking around the classroom asking "What's this?" over and over while letting many kids touch the outside of the bag to guess what's inside. We learn "It's a cup/box/pen/dog/bird/kangaroo" today, using the book and CD-ROM. 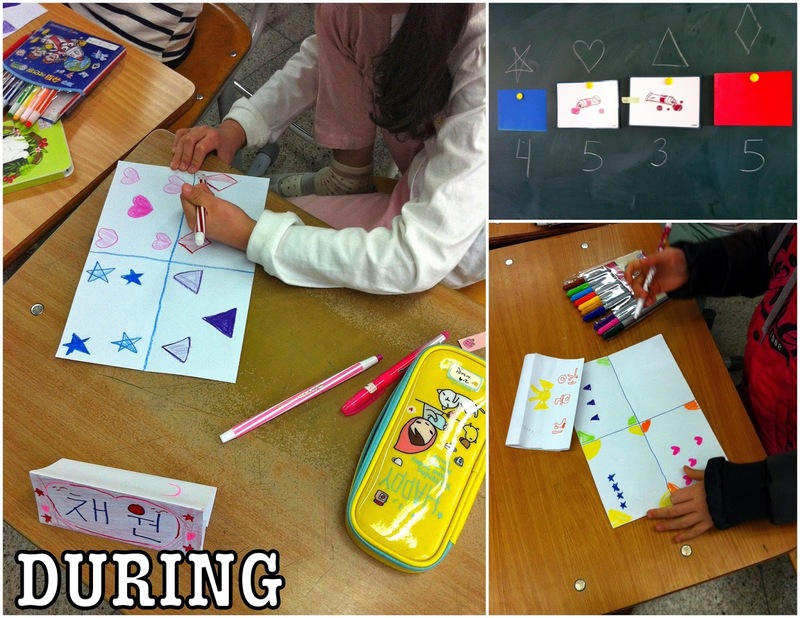 9:42 - After the first class leaves, YJ grabs the teacher's set of big flashcards from last year's 3rd grade book to see if we have picture cards of the items they're learning in this lesson. (We got new 3rd and 4th grade textbooks this year, and my one complaint is that they didn't come with big, durable flashcards like last year's books. Those were so handy and useful for various games/activities). I'd actually thought about looking for these flashcards yesterday, but ultimately didn't. We find all six items, between the 3rd and 4th grade units from last year. I use these in the next two periods for extra practice, and during our BINGO game at the end. 11:22 - We finish third period. This school year there are only three classes of third graders (not the usual four), so we're done with third grade for the day. I erase the chalkboard. YJ tells me next time I'll do period 2 with them. The next time I'll see them is next Wednesday, so that must mean she's going a bit out of order, as she'll teach 3rd grade again this week when I'm teaching with my other co-teacher. Just before I leave, she asks me to send her my after school schedule. 11:24 - I type of my after school schedule in my office and send it via Messenger to YJ. I love this period on Wednesdays because YH (with whom I share an office) is gone teaching fifth grade, so I have the office to myself for a period. The time goes by eerily fast, though. 12:28 - Three grains of rice fall from my spoon onto the lunch table, right next to my tray. I see and almost just grab it with my hands and throw it back in my rice bowl, but decide I'll pick it up with my chopsticks when I'm done eating with them. Maybe that's the most polite thing to do. 12:32 - A teacher grabs the box of kleenex from the small table where the principal and vice principal eat every day. (Those two eat at 12:00 every day and get the box of kleenex at their table for the duration.) One of the lunch ladies normally comes and gets it some point after they leave, but it's still there so a teacher moves it to our table. The teacher directly across from me - she's new this year, and the oldest person in our school I've been told - takes a kleenex and swiftly reaches her hand across the table and picks up the rice I had previously dropped from my spoon. 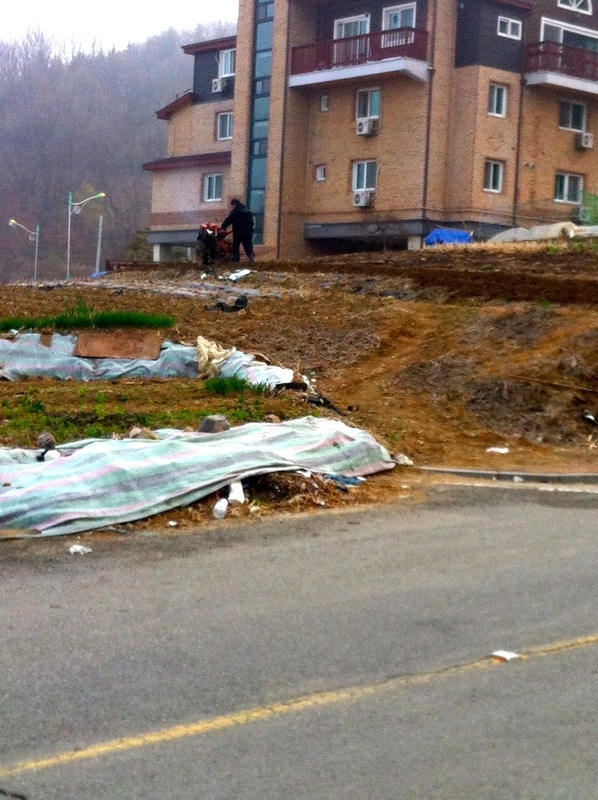 Elders are highly respected in Korean society, so I'm assuming it probably wasn't the greatest that she just cleaned up after me. Whoops. The fact that I had planned on picking it up in a few minutes was useless. 12:33 - I look around, all of the teachers who haven't already left yet are all eating dessert: our apples - some are finishing their second slice already. I'm still working on the rest of my meal, but I decide I won't finish all of the rice today so I begin eating my first apple half. 12:36 - I start spooning the rest of my soup's broth into the big bowl so that I just have to dump the one bowl when I take my tray up. I still have half an apple left, but I'm going to take it with me because the remaining four teachers are all finished eating. They're all waiting on me, and I hate that! I'm supposed to hurry up and just be done so we can all leave together. 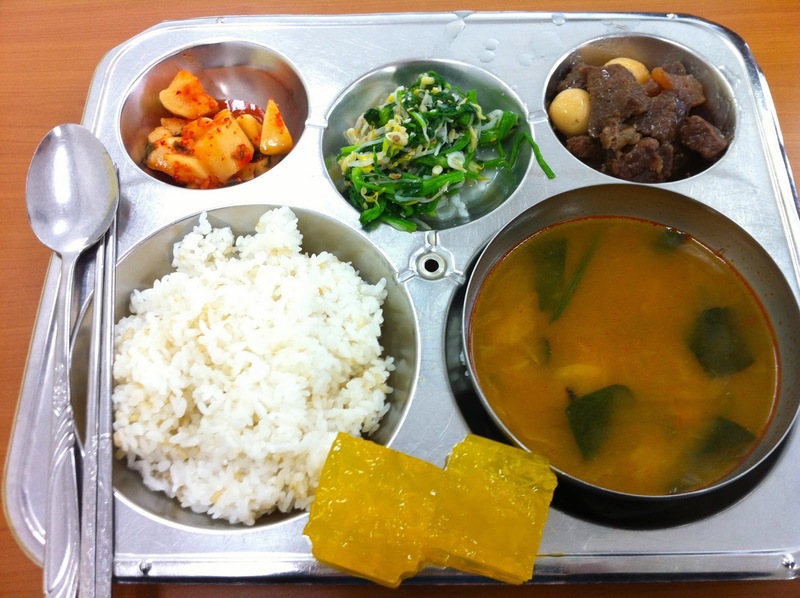 But me being a westerner who grew up in a country very much focused on individualism would rather they leave when they want to leave so I can take my time and enjoy the food, not eat super fast or not finish food I'd like to finish only for the sake of the group, as collectivist Koreans would do. Maybe I'm looking into this too much. Anyway, so I'm cleaning up my plate so we can go, and I want to get more of the broth from the tray into my bowl, so I tip my tray slightly. I transfer a few more spoonfuls and... plop! My second apple slice slides into my cubed radish kimchi sauce. I'm center stage, since everyone was watching me anyway - so they make a gasp sound and say stuff in Korean. One holds out a tissue, and I reach into my pocket because I have some in there. 12:44 - My co-teacher YH still isn't back in the office even though he left lunch before me. Must be elsewhere. 12:57 - YH comes into the office. I ask about the locked cabinet, if the first grade teacher really accidentally locked it shut yesterday, just to (attempt to) make small talk. So he gets up and starts trying different combinations. It's awkwardly silent. I'm thinking Wait, does he think I needed it opened now? While it would be nice to have the 8 rolls of toilet paper I just bought and brought in last week that are inside, it's not pressing. Don't need it now. So I'm watching and he's squatting down in front of the cabinet, focused, trying different combinations. The moment gets longer. Finally he says, "I don't know what to do. I'll have to call the school office later, or something." I secretly wonder how long it'll stay locked for, but I'm relieved he's stopped pursuing it for the moment since that had never been my intention. 15:40, so I have time for the planning I need to get done. 13:46 - I switch gears and work on daycare lesson plans for next week. 13:51 - My co-teacher turns to me and says "Ok, let's talk about fourth grade tomorrow". He did not teach English last year, so I've only co-taught with him six times so far this school year. I'm still trying to get used to his style. I read through the Teacher's book yesterday and played around with the CD-ROM, so I know what's coming. But he opens the student's textbook to chat about the period. (Note: The English textbooks are not a resource for the students. There's not a list of key words for each chapter -- just the activities that will be done in class each day. The students need a teacher to explain each activity to them. And all of this explaining/activities you should do are in the Teacher's book. You usually could never look at a page in the student's book and know how that was supposed to fill 40 minutes. So you read the Teacher's book -which although there is lots of Korean, there's enough English that you can figure out most things.) Anyways, point being that he obviously hasn't looked at the teacher's book yet, because he's trying to explain to me what we'll do by looking at the student book and directions, figuring it out as he goes along. I just nod and go along with it. He doesn't think all the students will use dialog for the activity part, so he says maybe we should play a card game (I guess they used cards today in class -- but I was teaching 3rd graders, so I don't usually know what they did). Did I have any ideas? So I suggest "Go Fish". He's never heard of it, but I used it with some different grades last year. I explain it to him (hopefully he understands so we can do an example for the class tomorrow to teach them how to play), and he says we can try it. He also prints out a worksheet with a few main words and phrases from the unit, so that students can practice writing in their notebooks. It sounds like he wants to do this tomorrow, too, but I'm not sure how that'll fit in with everything else. We'll see. 15:08 - My co-teacher YH leaves the office to go to a teacher's meeting. I'm looking up ideas for future 2nd grade classes -- new games and content. 15:25 - I unlock the English room and start setting up for my second graders. We're going to play some games today about shapes. 15:40 - Class should start now, but nobody's here. It's not unusual for them to be a few minutes late, though. 15:44 - I'm still the only one in the room. Could they have forgotten? Did the schedule change? This part's a little frustrating because I can't call or message someone on my own, I'd have to leave the English room and hunt down my co-teacher for help, so I decide to wait a bit longer. 15:47 - I hear loud footsteps. They're here. Six boys burst into the room! Where is everybody? We start singing the Hello Song. Afterwards, three more boys come in. They're eating some ice cream treat/afternoon snack and have tons of energy, running around the room. They're loud and playing with each other, nobody wants to look and pay attention to me nor be in their seats. Where are the girls?? There are usually more than 20 kids. You'd think it would be easier to manage the kids today since there are fewer, but it's extra crazy today. 16:02 - We finish our start of class routine and sing the Dream English Shapes Song that we learned on Monday to review before playing some shapes games. I'd wanted to play an erasing game, where I draw some shapes on the board, two people come to the board at once and each have an eraser. I say a shape name, and they try to erase it first. Except when I was setting up I realized there is now just one eraser at the chalkboard of our English room. No clue where the other ones went off to, so I changed the game so they had to draw the shape I say. Correct shapes get a point, and being first gets you another point. The boys took to rubbing their hands all over the chalk board and getting them chalky, and then touching people or things. When two boys were up for their turn, the rest were talking loudly goofing off with their friends. Some were standing up at the board rubbing their hands all over it. Utter chaos. There is a Korean teacher sitting in the back of the room this whole time, but she lets them misbehave more than I would, and they don't listen to her either. I really wish I could show you how crazy this class often is. Maybe I'll try to take a video tomorrow or Friday if the opportunity presents itself. Let's just say that on some days (like today), if you saw a scene of me trying to teach or get them to do an activity, you would think it was an indoor recess! 16:13 - One girl comes into class and sits down. We're now playing an online shapes/colors catapult game which they're actually way more into than I thought. After a team correctly answers a question, there's an animation of that team shooting stuff via catapult at the other team's castle, so the boys really like watching that. There is shouting and screaming. One boy is standing up on his chair shouting so loudly. 16:23 - We finish singing the Goodbye Song and everyone leaves. I do some sweeping and line up the desks, and then lock up the classroom. 16:36 - As I get outside and start walking home, I decide I must either sit at the park and read for a while before going home, or go directly home to change and go for a run. The weather is too perfect right now to be indoors. I opt for the run. 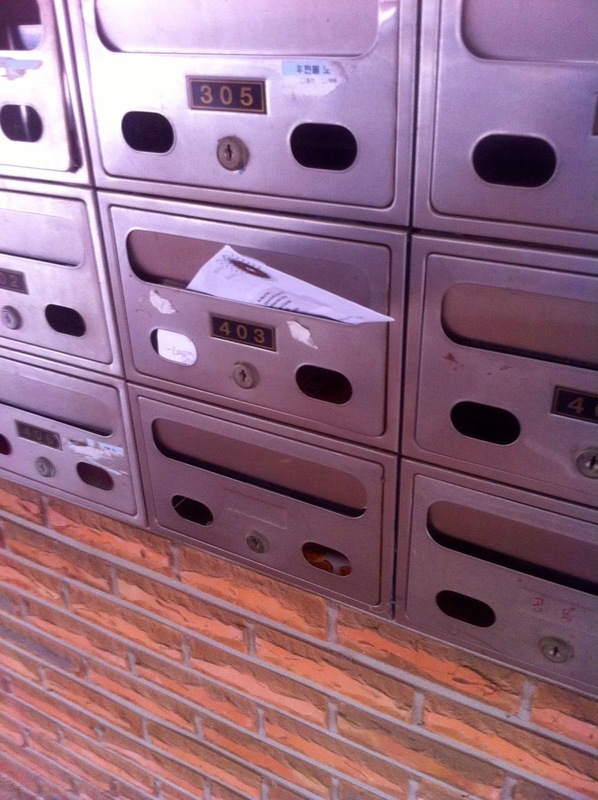 16:47 - I get to my apartment building - have something in my mailbox. It's a utilities bill, around $9 for the last month. I'll pay it tomorrow after school via a transfer at an ATM. 17:01 - I leave for my first run since fall, I'm so excited. 17:28 - I get back to my apartment building. It was a slow run and not as long as I'd like to be going, but it's been a long time since I've run, so I'm pleased and feel good. I stretch outside for a few minutes before going inside. 17:36 - Record my quick 10-second video for my Give it 100 project (stretching every day with the hopes of being able to touch my toes) and upload it to the site. 17:45 - Hop in the shower. 17:49 - I can't believe I've accomplished this much before 6pm. It feels great! Running always feels so good! I'm so excited for spring time now. I eat a banana and mix my daily glutamine + probiotic into my water bottle. The rest of my night consists of blogging, Duolingo French, snacking on gf pretzels and almond butter, reading blogs online, and more blogging. I'm about ready to post this, and then I'll make dinner (eggs + a little meat), and I'll call my friend again at 9:40. Then reading my book in bed and a nice bedtime no later than 10:30 for me! 1) What teaching methods have you found to be most effective with your students? Younger students like games and competition, though it's interesting how each grade and age group have games that will and won't work for them. 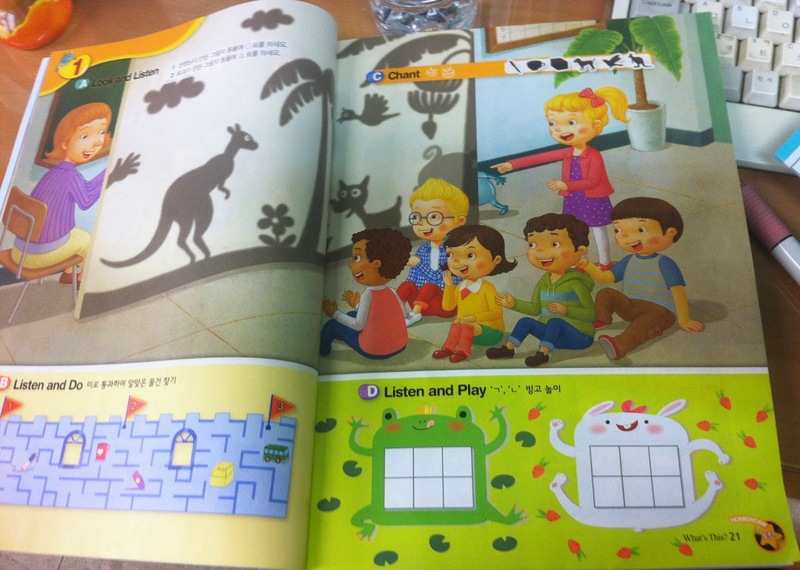 With my 2nd graders, I have to use very simple games that can be easily understood without an explanation in Korean because I teach them by myself. The other week when we learned "How are you?" I made a simple PowerPoint memory game. I had three pictures on the powerpoint, so we said what each one represented ("I'm happy. I'm sad. I'm hungry.") and had them look at it for a few more seconds, then I went to the next slide which was blank, and finally to the following slide which had the original three pictures with one covered up by a ? box. They understood that they were to say the phrase for the hidden picture "I'm happy", for example. (On this day it was back when their homeroom was in the English classroom, so their regular teacher had a bag of small chocolates she handed me to give correct answers. Everyone was super into it then!) So that's one example of a simple game that can be understood without explanation. I'm continually amazed at how into a game even the 5th and 6th graders will be if it's for points. And these aren't points that cumulate and result in a prize. The winners usually don't even get candy. No, these are just meaningless points for that particular game. I remember one day last semester when we were playing some PowerPoint review game with a 5th grade class, and the students were going absolutely nuts when they got questions right (as in cheering/screaming, hands-in-the-air celebration), and really upset if they lost points or didn't get one right. After a particularly enthusiastic reaction from a team, my co-teacher laughed and turned to me and whispered "They're not real! It's just points!". Really funny for us, but we're not about to point it out to them how silly they're being -- we're lucky that meaningless points still work for motivation! 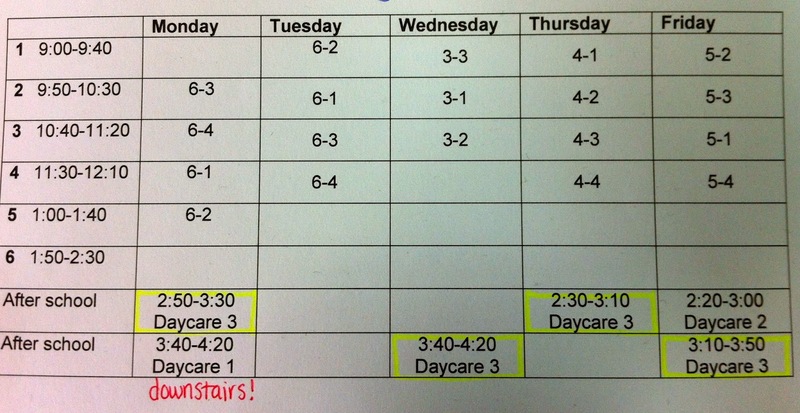 Routine has been a key element with my younger daycare classes. We always start the first 15 minutes of class with the Hello Song, the song for whatever day of the week it is, and then I ask everyone "How are you?' and "How's the weather?". Then some movement review "Stand up, jump, turn, clap, raise your hand, sit down, etc." before a review song. Class always ends with the "Goodbye Song". One final random technique I'll share: The first week this school year I couldn't get the young ones to listen and repeat new words for the life of me. Not interested. But two weeks ago when I started saying the words in funny voices - really low, really high, - or making a hand motion while I said the word, then they had fun copying me. Because it was a sort of game. The younger ones also like to touch and interact, so I try to give them as many opportunities to be moving or doing something with their hands, rather than sitting in a desk and listening (which wouldn't happen anyway -- they never stay in their desks no matter what I'm doing). 2) Do you think you're making an impact on your students' English ability? The students are also a bit more excited to see me around school, since I'm a foreigner (a rarer sight in the rural parts of this country), so that gives them some extra motivation/excitement with studying English. I'm definitely impacting my little after school daycare 1st and 2nd graders because my classes are exposure to English that they wouldn't have otherwise in daycare. This year I have 2nd graders 4 times a week after school, so I'm excited to see how much I can teach them before I leave, starting from scratch. Apart from English ability though, my presence has expanded their cultural knowledge. Korea is a very uniform country. People tend to look and act similarly, and the people are proud of their "pure blood". So I'm happy to sacrifice myself, in a way, and be the token foreigner for them, just so that these kids have some exposure to someone of a different race and culture. 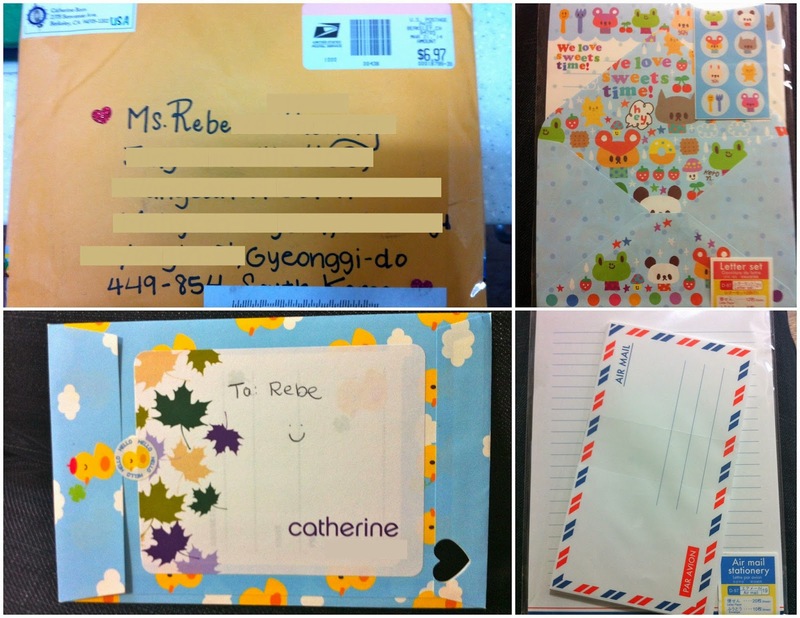 I try to introduce cultural things when I can, to both my students and my co-teachers. I also try to impact my students' lives in a positive way, which if it doesn't affect their English ability but makes them happier, more confident kids, then great. My school is poor, and many of our students don't have the best home situations, so they're dealing with other problems outside of school. Thus, I try to hand out as much praise and smiles every day that I can -- anything to make them feel safer and happier at school, to encourage and lift them up. I feel privileged that I have the opportunity every day to make a difference in these kids' lives. And you are still very welcome to comment with a question if there's anything you'd like to know! The whole group will answer it at the end of the week. Thanks for reading! 7:25 - Alarm goes off (I changed my usual alarm time last night). Press snooze. 7:32 - Start reading some BBB Day 1 blog posts in bed, as I was up too late blogging to read them last night. 7:36 - Get up and brush teeth, grab a banana then back in bed for more reading. 8:05 - I should probably get dressed now. Throw on some clothes. 8:14 - Leave my apartment. Make it to the stairwell and realize I should have put on my belt with these jeans. Go back and grab it, put it on. (Last year I'd always leave my house by 8:10 at the latest. Since winter break I've really been pushing it, because I discovered I can still get there on time even if I leave a bit later). 8:26 - While entering the school's back entrance, I see a student (maybe he's in third grade now) that I either had in daycare before or have now. I ask him "What's your name?" because I have no idea what it is. He audibly groans and doesn't say anything. I try one more time. Nope, he's not having it. Okay, I can take a hint. I laugh and easily forget that ever happened because walking past the first grade class to my office I get plenty of smiles and "hello"s! It's so great. 8:34 - My co-teacher YH comes in from next door and he gives me a small bottle of orange juice from my other co-teacher YJ. This is not an ordinary event - it's a lovely surprise. 8:35 - YH tells me that it's going to get up to 20 degrees (C) today, but it looks very cloudy and dreary out now. It's still very cold inside the building, so he turns on the little space heater. There were two attachments to the message that I didn't open. The Google translations are always terrible, but I do it just to get a general idea of the message's contents - to try to stay in the loop. Some fourth graders found or lost their cell phone(s). Delete. These kind of messages are becoming more frequent. 8:52 - I go into the English room to prepare for our sixth grade classes today. YJ is in there working at the computer. She is still very sick - worse, I think. I wonder if she's been working in the English room these last two mornings because it's quieter. Class starts at 9:00. 9:13 - One of the new phrases they're learning today is "Good luck". In the book's video clip the boy crosses his fingers (and holds them up) as he says the phrase "Good luck". So YJ has me demonstrate, and basically teach the class that when we say good luck in western countries, we hold up our hand and cross our fingers - which obviously isn't the case. But there wasn't time to get into it and explain to her while we're teaching, so I just go along with it. The book really hammered the (false) point home, as another character holds up his hand and crosses his fingers while wishing a girl "Good luck" in a later Listen and Repeat video clip. The kids thought the action was funny and kept crossing their fingers during class. 9:41 - We dismiss the class, and then my co-teacher YJ says something quickly in Korean and three boys raise their hands. The class leaves. A minute later the three boys return with mops and start mopping the floor. 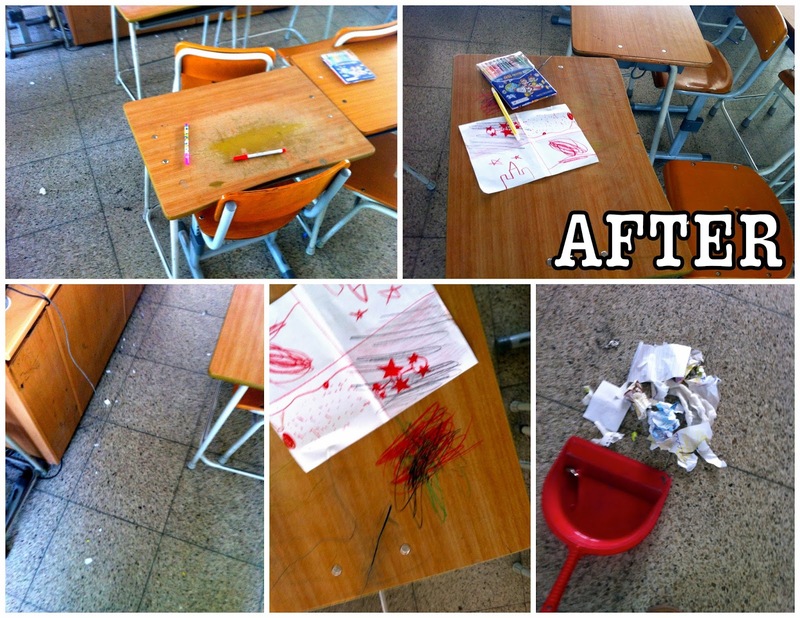 Normally classrooms are cleaned by the students in the afternoon, but I wonder if our classroom hasn't been assigned cleaners yet since it had been occupied by second graders for the first two and a half weeks of the school year. Whatever the case, it must have notably needed a mopping, so those boys mopped during the break time. 10:12 - I think to myself, now was this the second class or third class? How many times have I taught this lesson already today? I thought it had been three times already, but the clock does not agree. I realize it's only the second class. 10:34 - I leave the English room during break and stop by my office to rip off some toilet paper from a roll in there on the way to the bathroom. I see these boxes in our office that weren't there before. Probably stuff for first grade, I'm guessing. When I leave the office, this little first grade girl says "Hello" with her arms stretched out wide and the biggest smile on her face, and gives me a hug. I usually get hellos and some smiles, but never hugs - so that was great! Again, the school year just started this month so the first graders are completely new. At first most would just stare at me, but now they're getting more used to seeing me around and many say hello. 10:39 - Our next class enters all sweaty. They had PE right before and are complaining that it's hot in the room (they're just hot). My co-teacher has gotten progressively worse and doesn't talk at all this class. She should be at home in bed. 11:15 - Somehow we've finished the last activity with five minutes left, so I have two volunteers at a time say the dialogue from our last activity for the class. We're on the third set of volunteers when the bell rings. 11:32 - I'm starting to get a bit hungry, glad that lunch time is coming soon. Three of the six dishes were new: The seafood soup, fruit-jello cubes, and the combination of greens/veggies. I'm not making this stuff up! So much variety, like I've said. 12:25 - Most of the teachers leave our table (homeroom teachers must sit with their students, but us special subject teachers and administrative staff sit together) and it's just myself and YH. 12:26 - He quickly finishes, and waits around until I tell him again that it's okay if he leaves and he does. Who is at the teacher table each day varies based on what day of the week it is. This is only my third week of the new school year, so I'm still figuring out the schedule. For those who aren't teaching a fourth period class, they can go to lunch at 12:00. Those that teach get there a bit later, after 12:10. I fall in the latter category, so many teachers are more than halfway through their lunch when I sit down. My co-teacher YH can quickly catch up, but I'm not going to make myself sick by eating super fast when technically we have forty minutes to eat. 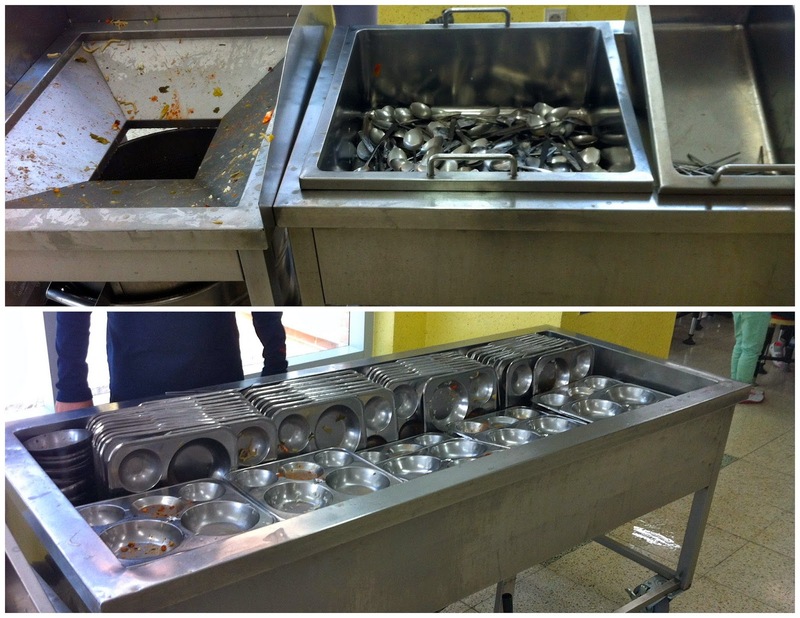 12:34 - I clean my tray by scooping any remnants into the soup bowl, then taking my tray to the trash/dirty dishes place. I dump my bowl into a big receptacle for food waste, put my spoon in the dirty spoon bin, my chopsticks in another, stack my bowl on the bowl stack (only teachers get bowls), and place my tray on top of the others. Tuesdays are the only day of the week that I don't have afternoon daycare classes, so I use the time to plan daycare classes for next week and take a look at my regular classes for the rest of the week (3rd, 4th, and 5th grade). 13:22 - I sign my attendance sheet for yesterday and today (forgot to do it yesterday, daycare went right up to the end of the day). Every day I must write the number of regular and extra classes that I've taught, and then sign my name. If there's a schedule change or something that causes a cancellation of a regular class, I only write the classes I actually teach that day, and the number of cancelled regular classes in parenthesis. At the end of each week I write the week's totals of regular (max. 22) and extra classes at the end of the line. And at the end of each month I need to get the sheet signed by my co-teacher, head teacher, vice principal, and principal. This is also the sheet where I would need to get any sort of leave pre-approved (vacation, sick leave, etc.) by getting the same four signatures. 13:29 - My younger brother comes on gchat and starts chatting with me. I'm looking at tomorrow's third grade lesson while we're chatting. 13:49 - YJ stopped in to return the English room key. I think she's either going home or to the nurse's room for the rest of the day -- good. 13:54 - Finish looking at third grade tomorrow -- hope YJ is feeling a little better by then. Younger brother signs off. I start working on daycare lesson plans. 14:34 - A third grade teacher comes in and starts talking to YH. I heard the Korean word "coffee" which sounds like "coffee", and they leave and go to the next room for coffee. I start writing one of my biweekly emails that goes out to a big list of family and friends every other Monday. I'm a day late, but it's okay. 14:55 - YH comes in to grab something from the office, then back next door where I can hear the voices of at least three different male teachers. 15:13 - Two first grade teachers came in to unload the boxes in our office (which was originally just their storage room. My last co-teacher and I moved in here during the winter because it was so cold in the English room where our desks had previously been). They're in and out for the next 20 minutes. At one point I think the guy has accidentally locked one of the cabinets with no key/code. The toilet paper I just bought is in there, so I hope it's not locked! 16:29 - I shut down my computer and ask YH if he's leaving now (my co-teacher last school year always started packing up at 16:25 and we left together at 16:30, not a minute later, but my new co-teacher YH often stays later -- but I don't think he necessarily has that much work to do). He says he's making a grammar worksheet for fifth graders for class tomorrow. And I'm in for the evening. I eat a banana, do a quick French review session on Duolingo, read, journal, blog, eat dinner. The blogging spans a few hours. I finish blogging here on time to call my friend in the states at 21:40, when he's driving to work in the morning. 1) How does your school experience at the age of your students compare to that of your Korean students? 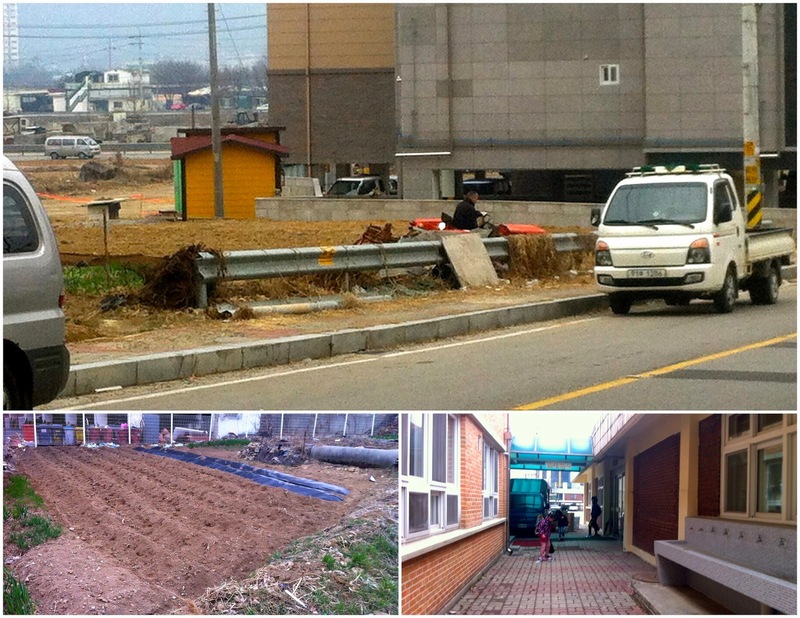 I went to elementary school in Wisconsin, USA in the 90s but currently teach at a poorer elementary school in rural Korea. There are many differences between my school experience and that of my Korean students, so I'll just start naming them. Bare with me and we'll see where this goes. My elementary school didn't have periods, bells, nor passing time, but my Korean elementary students have six 40-minute periods a day, each separated by a 10 minute passing time. I didn't study any foreign language in elementary school, whereas English is compulsory here - like science and math. Korean students clean the school, and they take off shoes and wear "slippers" inside every day. Our students here get letter grades, but at my elementary school in the states our progress reports and report cards rated us on scales like "Needs improvement" and "Satisfactory". Cell phones weren't even around when I was in elementary school, but here in Korea even the little first graders have smart phones; it's so crazy. And you see them out all day -- both in the hands of students and teachers. It's completely fine for teachers to have them out too, which is different from all my previous work environments. School lunch is another big difference. 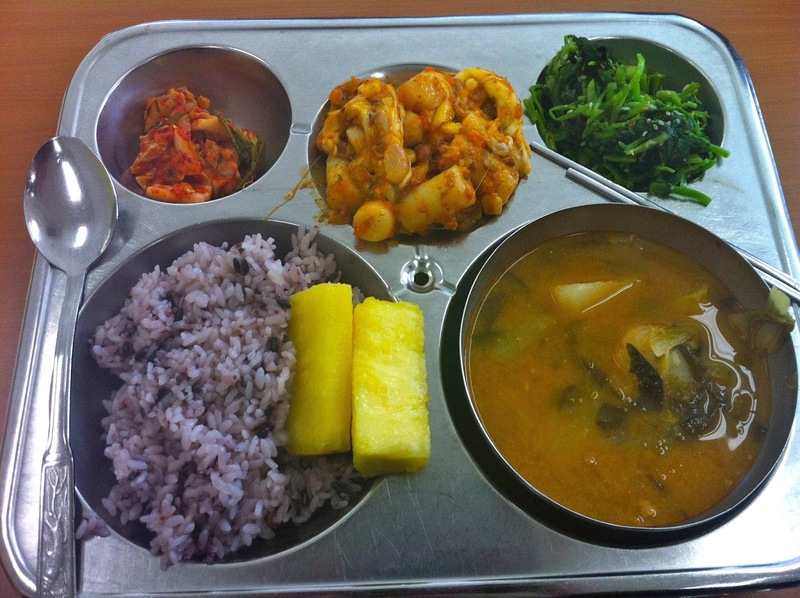 In case I I haven't made it clear already, I love my Korean school lunches. They're delicious, healthy, and varied. When I was in elementary school I almost always brought a lunch from home, but everyone has school lunch here (at my school, at least). Also, the hot lunches served in my elementary school in Wisconsin were neither healthy nor delicious. At my elementary school growing up the library had some TV/VCR carts that could be wheeled into the classroom if we were going to watch a movie. Most of our instruction was done with overhead projectors and chalkboards. At my school here in Korea every classroom has a Samsung TV up at the front somewhere, which is hooked up to a computer at the front of the class. We use chalkboards too, but the TVs are mostly used to show textbooks' CD-ROMs and PowerPoints (or youtube videos of songs if you're in my daycare class!). In the states the principal of an elementary school is usually in charge of discipline in some way or another. Teachers can send students to the principal's office if they're behaving really badly. I actually asked my co-teacher YH about this a few weeks ago, and he said Korean principals do not have that role. Say that a Korean teacher were to send a misbehaving student to the principal for punishment, it would only reflect poorly on the teacher. It would mean that the teacher was not capable of controlling his/her students, a huge fail. There aren't any special education instructors at my elementary school in Korea, and last school year I was instructed by my prior co-teacher to simply ignore a few students while teaching. Those students had some type of learning or mental disability perhaps, though I couldn't tell any difference between the other students. I was actually talking to a sixth grade boy (last year), trying to engage, when my co-teacher told me to stop talking to him - to just let him sit there and do nothing. That was a shock, but I haven't had any similar encounters so far this school year. My mother is an elementary school teacher in Wisconsin, and she's taught at her current school for (over?) fifteen years now. But in Korea, teachers change schools every 2-5 years. The reassignments take place during the 2-week "spring break" between school years at the end of February, which felt quite last minute for me. Oh, and my elementary school in the states was comfortably heated in the winter. I cannot say the same for my school in Korea. 2) If you had the opportunity to change 5 things at your school, what would they be and why? I would give us a bigger budget so we could build a gym/auditorium. 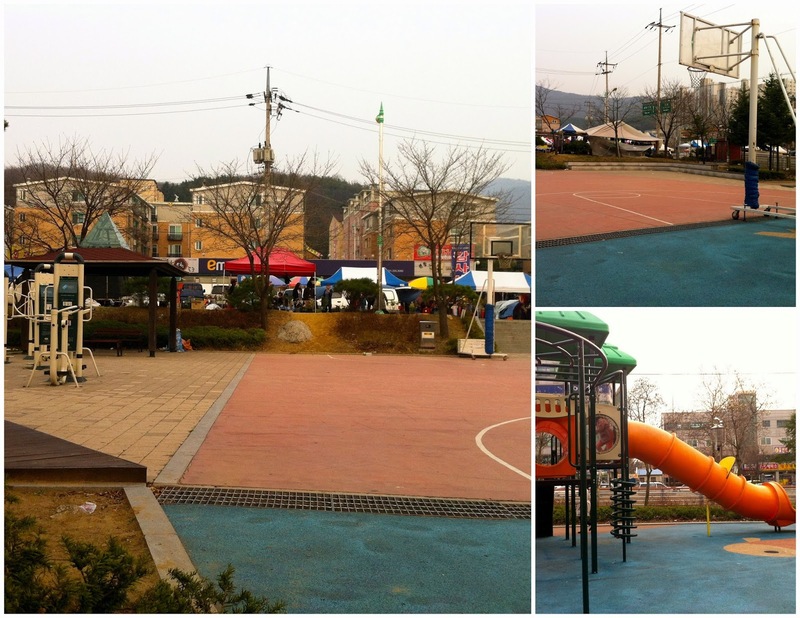 Most schools in Korea do have gyms, but mine does not. They have PE class outside in the dirt field in front of school, but availability obviously depends on the weather. Young kids need to run around! I would add recess. It looks like the students can go outside after lunch if they finish early (But there are never too many out there. Most are cleaning somewhere or back in their classrooms, I think), and they do have PE class - though I'm not sure how often. Regardless, many of my own elementary memories were of recess, playing outside with friends. Using our imaginations and playing games. Running around to use our energy. Kids need to move! So I would add some recess times to the school day. I would put carpet on the floors, or rugs in the classrooms. I think the preschool/kindergarten classes on the first floor might have carpet, but every other classroom has cold tile (cement) floors. Again, thinking back to my elementary days, sitting on the floor for a story or sitting in a circle on the floor for an activity/game happened quite frequently. I can't tell you how many times I've wanted to do an activity this year that would have worked so well if we could sit on the floor. But our floors are cold, hard, and dirty - so that's out of the question. I would minimize the paperwork that teachers need to do. I'm exempt from this, and I don't understand all that it entails, but apparently the higher ups constantly demand reports/paper work from the teachers with very little notice. So teachers at my school are usually quite busy working on this paperwork. Meanwhile their focus should be on teaching their students and planning those lessons, but it seems that most of the time it's actually spent on this extra administrative paperwork stuff. If you made it all the way down here, give yourselves a pat on the back! And now get ready for five more Day 2 posts by my fellow BBB bloggers! Yeah!